Get a good look at what John Deere Tractors are all about in John Deere Tractors, including brilliant photographs of the most famous tractors in history. Since the early 1920s, John Deere tractors have been cultivating, plowing, and seeding fields across America, and across the globe. Take a look at the amazing machines that are John Deere, including the history of the machines as well as modern tractors. American agricultural and mechanical know-how at its finest, these tractors have more than lived up to the company motto "Nothing Runs Like a Deere," in the process becoming the most beloved machines among farmers. 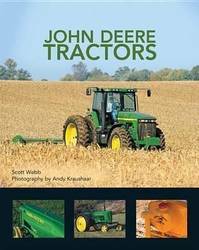 A celebration of this icon of American farming, this book features brilliantly detailed photographs of all the most popular and powerful John Deere tractors, along with a wealth of information about these marvels of machinery. Learn about the beginning of the company up to the present day president and John Deere headquarters. The book contains everything a loyal fan of John Deere could hope to find, from curious tidbits to historical facts and horsepower statistics, from Nebraska test results to implement information reaching from the early 1920s up to the present. Enjoy John Deere Tractors anytime, even if you can't get outside to sit on one.